Top policeman at Nato Summit says stun grenades were destroyed an hour before they were set to explode in path of world leaders. A study by Cardiff University reveals the Nato summit held in Newport and Cardiff last week had an “Olympic effect”. Researchers at Cardiff University studying community reactions have found wide variations at first in public perceptions of the event. The university's computer scientists used social science methods to assess community reaction in an experiment examining “mass” reactions to events on social media whilst also homing in on specific incidents as they were unfolding on the ground. 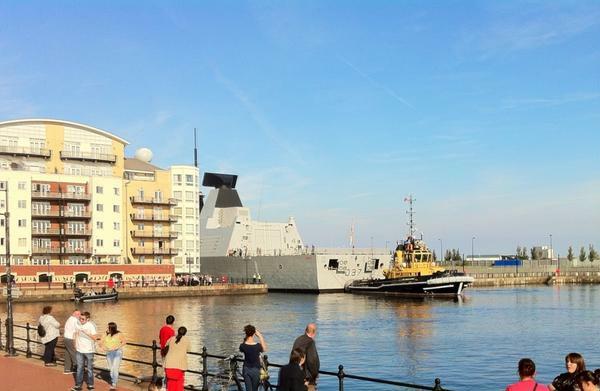 'Meet the Forces' day was a crowd puller on Sunday as warships open up their decks in Cardiff Bay following Nato summit. Organisers estimate that up to 70,000 people attended today's military open event in Cardiff Bay, to mark the end of the NATO summit. Royal Navy Type 45 Destroyer HMS Duncan was the main attraction - and five other warships from NATO member states were also open to the public. The British army and RAF also played a part - with children enjoying the chance to clamber aboard a military tank or jet. Thousands of people are in Cardiff Bay for a military open day after the NATO summit. Members of the public have been invited onto HMS Duncan. One of the Royal Navy's most advanced warships ever, Type 45 Destroyer HMS Duncan, and naval ships from five other NATO member states have been opened to the public. The First Minister and Welsh Secretary officially opened Meet the Forces day on board Norwegian ship HNOMS Skudd. RAF replica aeroplanes are on display, and army tanks and other vehicles available for visitors to try out. HMS Duncan lead chef Matthew Jones, from Merthyr Tydfil, said he was 'incredibly proud' to be part of the NATO events. Britain will send the 9ft 'ring of steel' fences used at the Nato summit in Wales to Calais in an effort to stop illegal immigrants getting into Britain. It would replace the "inadequate" fencing currently in place and hopefully create secure parking for legal travellers to wait without the threat of hassle from any disruption. Immigration minister James Brokenshire said the move is part of a bid to send a message that the UK is "no soft touch" for migrants. Writing in the Sunday Telegraph he warned would-be illegal immigrants Mr they "should be under no illusion about what awaits them if they arrive here illegally". He said it was up to the French to maintain security and order on their own land but Britain would do what it could to help. The security operation surrounding this week's NATO Summit has been described today as a 'feather in the cap' for Gwent Police. As nearly ten thousand officers were drafted in from across the UK make their way home, and the vast ring of steel continues to be dismantled, senior staff have hailed it a big success, as Tom Sheldrick reports. The Police and Crime Commissioner (PCC) for Gwent has praised police for their work during the security operation at this week's NATO Summit in Newport. Gwent Police led the operation - one of the biggest ever undertaken in the UK. A total of 31 arrests were made over the week, for offences such as trespassing and assaulting police. Over 9,500 officers and staff were drafted in from 43 Forces for the event, which posed a bigger challenge than the London 2012 Olympics. It saw police collaborate with intelligence agencies and military personnel to ensure the safety of sixty world leaders and their staff, as well as the public. Gwent Police and Crime Commissioner Ian Johnston said it was a 'feather in the cap' for Gwent Police. Every single police officer, staff member and volunteer from all over the UK who worked during the summit and in the build up to it can be proud of themselves. Their hard work and effort ensured this historic and momentous occasion for Gwent and Wales ran so smoothly. The response from the public has also been described as very positive. Assistant Chief Constable Chris Armitt, who led the policing operation has thanked local residents. Wales has been in the headlines for all the right reasons and I'm proud of the part the police service has played in delivering a safe summit. We would like to thank residents from across South Wales for their cooperation throughout the NATO Summit period. Their support has been very important and has helped ensure the success of the policing operation. Police have confirmed they made a total of 31 arrests during the NATO summit. They include five for aggravated trespass, two for assaulting a police officer, and two for making hoax bomb calls. During the summit hundreds of peaceful protesters marched through Newport and Cardiff but the number of campaigners was lower than anticipated. Assistant Chief Constable Chris Armitt was the events gold commander. At a news conference on Saturday he told journalists the operation had been a great success.